There are many kinds of fountains that can be installed in your garden. If your outdoor space cannot permit a pond that will serve as a water feature, let a backyard fountain do the job. Backyard fountains are a great addition to your outdoor space for a lot of reasons. One reason is this water feature helps make your backyard look really good. 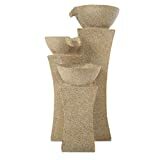 Any two-tier fountain is an attraction to any backyard. This DIY project will not eat much of your time on a weekend. This is one of those backyard fountains that's easier than cooking pot roast. Don't fuss over the huge and expensive sets because you can do well with a DIY fountain. Consider your space and backyard landscaping in deciding what fountain to have. You can start easy with a two – tier fountain. Firmly press drain stoppers on the large ceramic pot's holes. Add caulk around each stopper. After the caulk sets, turn the pot over and apply caulk on the undersides. Let it dry overnight. Drill a hole to the plastic saucer, this will be for the pump tube. Fill the large ceramic pot with water. Turn the plastic pot upside down and rest it on the bottom of the large ceramic pot with water. Set the pump on top of the overturned plastic pot. Make sure the pump's tube is facing up. Fill the large pot with water, just below the rim. Place the saucer on top of the ceramic pot filled with water and have the pump tube sticking up at the center hole. Place the smaller ceramic pot on top of the saucer with the pump tube coming through the drain hole. Place the nozzle of your choice on the end of the pump tube. Put some stones in the pot and saucer. Spread them into place. Plug in the pump and enjoy your new fountain! The Solariver Solar Water Pump Kit will move water day and night without ever plugging into the grid! Perfect for large fountains, water features, ponds, streams, waterfalls, hydroponics, aquaponics, greenhouses, rainwater collection, animal troughs, natural pools or anywhere you need to pump water and don't want to run power to or just want to save on expensive energy bills! The durable and efficient submersible brushless magnetic pump has a long life (20,000+ hours), has a removable pre-filter to prevent debris clogging impeller and is non-toxic to fish, frogs and other aquatic life. The 20 watt solar panel is framed with aluminum, comes with a stake and can be placed up to 16 feet away from the pump with included power cord. Optional 16' extension cord sold separately allows for placement even further away from the pump. 1 Year Warranty - 100% Money Back Guarantee if our pump kit doesn't meet your water pumping needs! There you have it! Your own two-tiered backyard fountain. Because there's a lot of room for creativity, you can actually create different kinds of backyard fountains too. I've seen pondless fountains and endless fountains all built in one weekend by avid DIY enthusiasts, so I'm pretty sure there's going to be one right up your alley. Click here for more DIY backyard projects.